The Meta Gadget for Blogger. ~ The Blog Doctor. You are here: Home > Widgets > The Meta Gadget for Blogger. The Meta Gadget for Blogger. Wordpress has a meta widget which can be added in the sidebar. It contains links to login, logout, feed links and the link to Wordpress.org. Blogger does not have such a gadget. Instead it has the Blogger Navbar which can lead you to nasty blogs. Click this link to open the Customize Gadget page. Copy the code after customization and paste in a Html gadget in your blog. 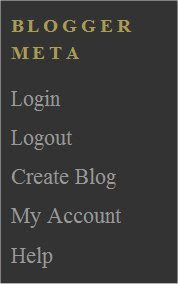 Click above button to add "BLOGGER META" to your iGoogle page. 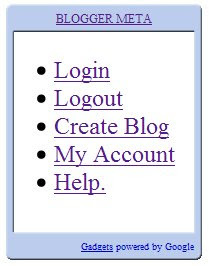 You need not worry that someone will click on the Login links to login to your blog. That does not happen in Blogger unless you have invited them to be team members of your blog. Besides without your password and user email they cannot login to your blog. Have a look at The Navbar in Blogger! Awesome. Thanks, Vin. Btw, before I left the previous comment, I used the search on your blog for nav bar and navbar and didn't find the post you pointed me to, only this one...? hey Vin..just wanted this blog for meta gadget was amazing..i customised my own blog and had no clue how to fix nav bar in it..thanks for the help man! !